We at PrecisionTrak contact all cable systems/interconnects of any significant size which have cable advertising insertion capabilities. 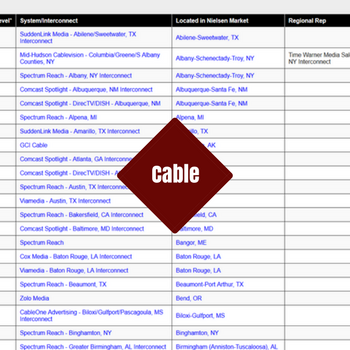 We currently list 2,256 cable systems/interconnects, of which 556 are shown with full sales and traffic contact information. It is our intention to list all of the systems as an indication of the cable subscriber geography involved, and to organize those systems in the cable ad sales entities through which their cable television advertising time may be purchased. The cable section provides a directory of systems and interconnects based on cable ad sales, not based on individual cable systems. Many (in fact most) of the nation`s cable systems are not listed individually-but those systems not listed also do not accept advertising at the cable system level. We include every significant system, cable representative, or interconnect that directly accepts cable television advertising. Each listing contains information about the cable advertising sales and traffic office(s) for a system or interconnect within that DMA, regardless of the physical location of that office. Advertising sales locations may or may not be in the same physical location, or even DMA, as the cable system(s) they represent. Nonetheless, we have included ad sales information for every system that we can identify with ad insertion capability in every DMA. Please contact us in order to learn more about the benefits of having access to our Cable data and reporting engines.